Have you heard of the recent Attack on Titan OVA? It’s subtitled “No Regrets”, but it’s also known as a two-part OVA which chronicles the meeting of the hottest Survey Corps couple (pair? duo? ), Levi and Erwin Smith! This OVA is apparently the adaptation of a shoujo manga of the same title. Take note, guys and girls, the source material is shoujo material. Of course, its story wasn’t written and the art wasn’t inked by Isayama himself. And it’s supposedly about these two guys, y’know? I don’t know how much supervision Isayama had over this spin-off product. But, well, it should be good. At least, this first OVA (that came out last December) was quite enjoyable. 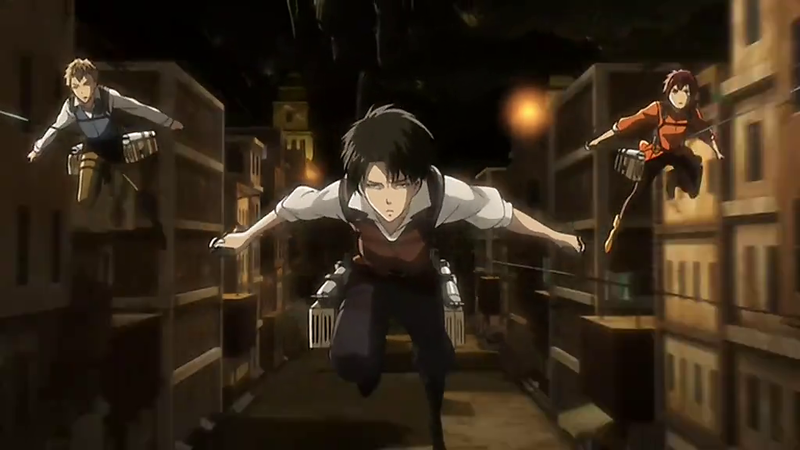 Levi was the gang leader of three thugs who, as this OVA tries to say, were doing the bad things for the good reasons. They lived in the abandoned underground town, where the “lowly”, “filthy”, and “undeserving” humans of the walls are transferred into. Deprived of the rights to go out to the surface where sunlight is abundant, life wasn’t beautiful nor easy. People here were easily manipulated by the merchants (who are painted as the bad guys here) and the guards of the staircase, which led up to the surface, by increasing the exit fees as much as they liked. So we pretty much have an idea how a rebellious Levi came into being and under what likely circumstance he and Erwin Smith met. 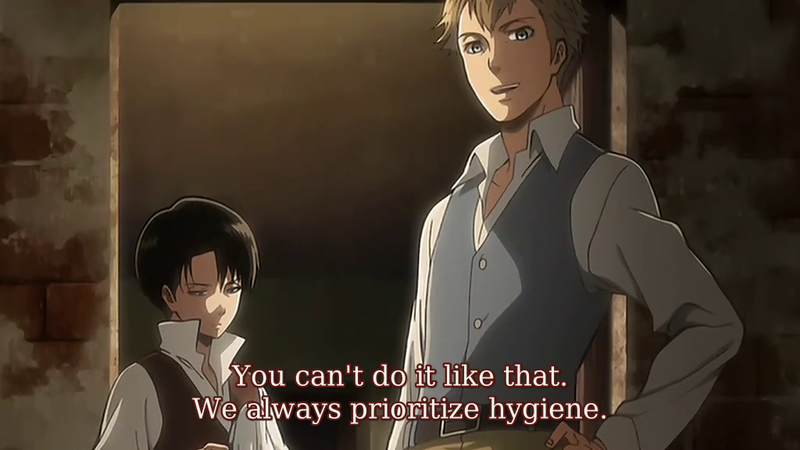 Putting that aside, this episode confirms that Levi is the serious, clean freak character there is. Is it because of the consistent character writing? Or is it due to the spin-off author poking fun of Levi’s image? We don’t know the answer for sure, even though it could be most likely the latter, but even Farlan is infected by this clean-freak disease that Levi is spreading. Doesn’t sound like essential viewing, but I guess they need to churn out some content to maintain interest as the next season is so far away. Disregarding the ‘Levi heichou, clean freak heichou’ thing going on here, the OVA does provide some backstory to two of the essential characters in the series. Their meeting was already mentioned in the first season, and I myself admit of being interested how they just clicked together despite the seemingly immiscible personalities they have. And yes, it seems like the hype hasn’t totally died out, with the second season to look forward to. One year later may feel far away, but it will seem only like yesterday once it’s 2016. Oh gosh. I think I should have chosen Levi as the anime character that I’m most similar to in the 30-Day Anime Challenge. Anime characters may resemble you in one way or another; that’s why that question is not that easy to answer… except if you’re totally convinced you’re very much alike with a certain character, which is kinda creepy, yeah. Haha. No I was just joking (a bit). Your post is about a clean freak Levi & people (especially my siblings) have been calling me the same thing. If he’s ever kicked out of the Survey Corps, he won’t have trouble finding another job again. Ehem. It can get weirder than that. I think the manga’s author for this spin-off series is one of the fanbase members. 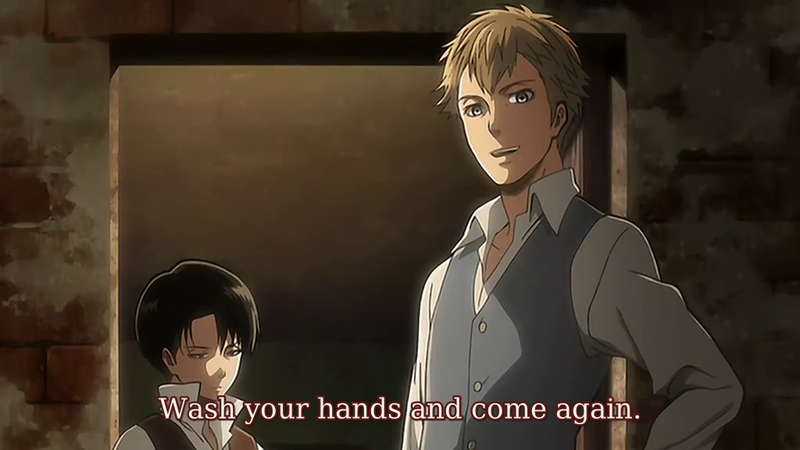 That should explain why Levi’s clean freak personality was given much highlight for fans to squeal to. If I were a diehard SnK or Levi fan I would squee too but since I am neither I find this amusing at best. Besides as far as male characters go I’m more a fan of that guy who looks like he got a haircut and my boy Armin. Hard for to remember most names in this series. Ah, you mean Connie Springer? Boy, he’s my favorite! That buzz cut is just so adorable. Armin is my second favorite, too! Well, he climbed through my SnK ranks when I discovered he’s an INTP type like me. Yup. I like Armin’s logical rather than gung-ho approach in the war zone. 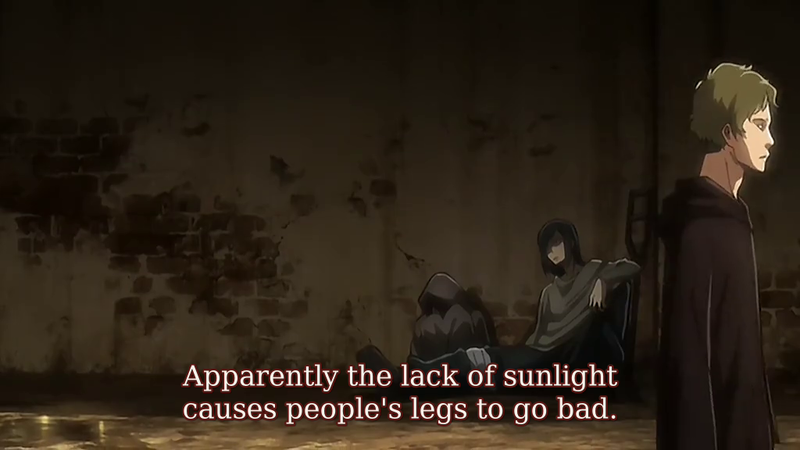 … which Levi puts to good use, I must say. Maybe I should’ve added how nice of a breather this episode was due to a lack of any Eren.